In viewing the tapestry of Mrs. Anastasia Tamošaitis one could note three different periods of her artistic work. The first period started in Lithuania and continued in the first ten years of her life in Canada. "Baptism of Morta", "St. John" and "Persecuted", all created in Canada, represent this period. The tapestry works of this period are calm, solemn and somewhat static, following the so-called classic or traditional school. 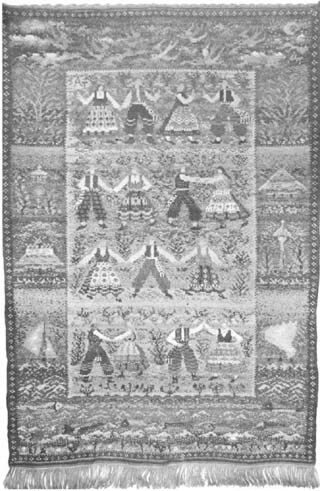 With this type of tapestry Mrs. Tamošaitis became an established and recognized artist in Lithuania. Many of the tapestry works of this period had distinct Lithuanian themes and many decorative elements from Lithuanian folk art. Her second tapestry work period was dominated by abstract and semi-abstract, or non-figurative works. This period coincides with the artist's rather intensive work in oil and water-color painting, especially in gouaches. Her abstract gouaches were extremely colorful and dynamic. In all tapestry works of this period color, line and composition are predominate. One of the early non-figurative tapestries "Springtime" is still of subdued colors and rather calm. Late works of this period, as "Flash of Colors" are remarkably colorful and lively. 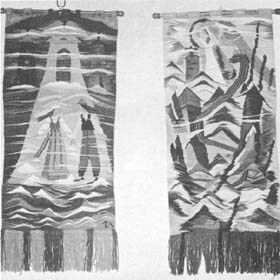 Many abstract tapestries of the same period have some highly simplified elements of figures or scenery. Works of the recent years make a third period. Now more distinctive figurative elements and themes are molded into the abstract backgrounds of the tapestries. Colors are more bold, one can see more red and yellow, and the former favorite color of the artist — blue — appears less. The introduced figurative elements show great elegance. In "Wedding of Eglė" and "Farewell" girls and boys are graceful, one can feel their vivacity; castle and towers appear light although the structures are massive. Although these tapestries have more scenery and figures, actually, color composition, balance of planes and mass prevail and figures are subtly molded in them. In "Brothers Raven" one does not see too many ravens, and even without them the tapestry is aesthetically an almost completed work. "Day and Night", an impressive set of two tapestries, is very close to the so-called pure art when the artist expresses himself without visual objects. Creation of the art tapestry is difficult and the artist does not have the same freedom as with a brush on a canvas. But in Mrs. Tamošaitis' hands tapestries become works of fine art. Everybody admires the variety and originality of the weaving techniques and her ability to convert cold and raw thread into lively, aesthetic and moving artwork. Besides the technical perfection, the on-looker is attracted by vividness of colors, their subtle distinctness and forceful composition. 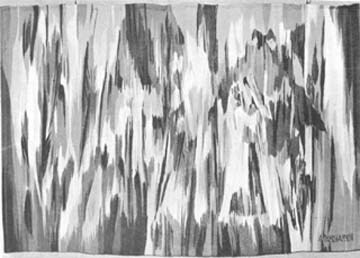 In abstract or semi-abstract tapestries one feels strong movement upwards and into space. In Mrs. Tamošaitis' tapestries there are numerous elements of Lithuanian folk art interpreted in the artist's own way. Mrs. Tamošaitis made very extensive studies of Lithuanian folk art and, especially, of weaving. 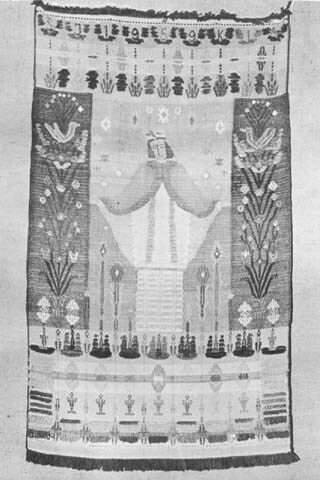 She is a pioneer introducing picture and asymmetric composition in Lithuanian tapestries. She has woven a great number of individual Lithuanian folk costumes, so that all folk art elements and their adoption for modern artwork are in her subconsciousness. As a matter of fact one can see in her tapestries that she has a great love for Lithuanian folk art. However she is able masterly to weave all these folk art elements into her artwork of modern spirit and modern forms. Anastasia Tamošaitis (Tamošaitienė) is a native of Lithuania where she studied at the Women's Fine Art School in Kaunas. Later she studied fine art, weaving, and tapestries in Sweden and Austria. In 1948, she came to Montreal, P.Q., and established her own Art Studio. In 1950, she moved her studio to Kingston, Ont., where she now resides with her husband, who is also an artist. Between 1932 and 1936 Mrs. Tamošaitis wrote four books entitled Knitting, Weaving at Home, Handicrafts for Young Girls, and Our Handicrafts. For a number of years she has lectured at various schools and held many exhibitions of her work internationally, including Paris, 1937, Berlin, 1938, New York, 1939, and Women's Expo in 1949 and 1953 in New York. In 1949, 1950, 1953 and 1958 she participated in the Canadian National Exhibitions at Toronto. Her recent exhibitions include Čiurlionis Gallery, Chicago, 1961; Lithuanian Hall, Baltimore, 1963; Lithuanian Hall, Los Angeles, 1963; University of Montreal, 1963; Brooklyn Auditorium, N.Y., 1964; Čiurlionis House, Cleveland, 1964; Art Museum, London, Ont., 1965; Queen's University at Kingston, 1965; University of Ottawa, 1966; University of Detroit, 1967; Sarnia Art Gallery, 1968; Ottawa Little Theatre Art Gallery, 1969; University of Windsor, 1968 and 1970; Canadian Embassy, Washington, D.C., 1970; National Library, Ottawa, 1970; Boston New City Hall, 1971; Toronto, 1973; Goethe Institute Ottawa, 1974, and Čiurlionis Gallery, Chicago, 1974.